If the last time you truly thought outside of the box was when you colored outside of the lines, then maybe you need a little inspiration. 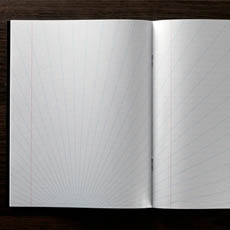 The Inspiration Pad changes your perspective of lined paper forever with crazy designs that bend, zig zag, swirl or just otherwise defy the norm. Try to write in the lines and create outrageous letters and notes, or ignore them altogether… either way you’ll be inspired to approach everything you write in a brand new way.